Accompanied my dad on a trip to KL to settle some of his business. Flew Air Asia thinking we go a great deal only to realised that it would have taken us the same number of hours to get to the hotel had we taken the coach. And at a fraction of the already very low airfare! So anyway, I look forward to the trip as I get to meet up with DrS and was planning to stuff my face with Malaysia food!! 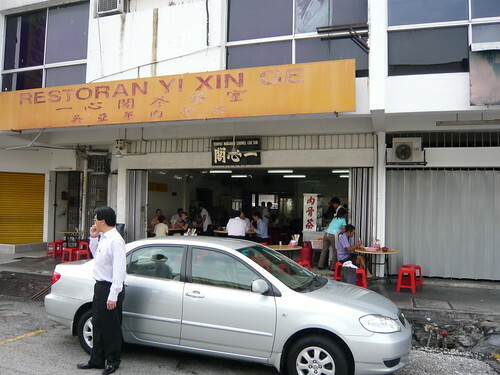 Morning breakfast was at Restoran Yi Xin Ge. Very rustic and possibly been around for years. Granted the Bak Kut Teh in Singapore are also damn good at some places, the one thing that made it stand out from all the Bak Kut Tehs I've tasted was the soy sauce. Yes, you heard me right. Not the bak kut nor the soup. It was the soy sauce. For some strange reason, it was very tasty with a tinge of sweetness which we later discovered was due to the fact that they blend in caramel into their soy sauce. I also noticed that there were a lot of Myanmese worker there. Had it be in Singapore, it would have been PRC Chinese instead. So I ask why. Friend told me that it could be (speculative) due to the fact that the Malaysian Gahmen don't like too many Chinese to be in the country and as such made it difficult for a PRC Chinese to get a working visa here. So this particular Myanmese was a supervisor at the restoran who took out orders. He spokes excellent Cantonese! Oh yes. Cantonese. KL is a weird place where Cantonese is THE dialect of choice regardless if you are Teochew or Hokkien or any other dialect group other than Cantonese. From what I've heard, it is some kind of a status thing that you are branded second class if you can't and/or don't speak Cantonese. I find that particularly sad considering the fact that the Chinese are already second-class citizen in Malaysian and that you are second class of the second class simply because you do not speak cantonese. Really WTF right? Again, from what I've heard, this thing about speaking Cantonese is no longer as elitist as before as more and more Chinese are not going out of the way to make that distinction any more. Is that true? Can any Malaysian Chinese readers here verify? naeboo: Makes me wonder why the distinction in the first place. And why Cantonese of all the dialects? because of TVB and canto pop influence in the 80's and 90's, i suppose. Its a Cantonese ego thing. But now, for the younger generation, it's an English ego thing, many cannot or do not bother to speak proper Mandarin, let alone their family dialect. i wouldnt have a clue on KL past, but current working life here with 1year experience, tells me the crowd will fall into English and Mandarin pretty easily. cantonese are more spoken on a street-wise situation. though its still hard not to laugh at "lee-turn op invetman". KH: I think this will come a full circle when the Chinese economy were to take over, then perhaps then it would be a Mandarin ego thing. Who knows? sthg to do with the old gangster clans, the hakkas and the cantos. the hakkas won (yap ah loi's clan) and the cantos somehow held on their tongue to speak canto to piss the hakkas off. to prove a point? naeboo: Is that right??!! How very interesting!! Kinda surprised to see comments on speaking cantonese is being looked as different class of Chinese or its because of trend reasons. Here are some facts on Malaysians yo. In central Penisular Malaysia region inc KL and Ipoh, most chinese speak canton as their ancestors came from southern China in the earlier days whereas most of us speak Hokkien and Teochew in the nothern, southern and Borneo region inc JB, Penang & Kota Kinabalu.